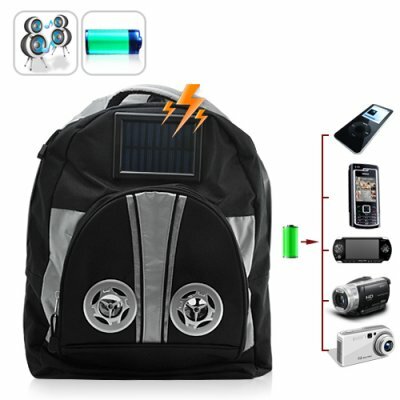 Successfully Added Solar Battery Charger Backpack with Bonus Stereo Speakers to your Shopping Cart. Keep your electronic devices charged on-the-go with this Solar Charging Backpack. It's never been easier - just use one of the 8 provided connectors for instant charging of your mobile phones, digital cameras, handheld game consoles, MP3 players, and many others! Built tough for use as a weekend hike bag or as a large day-pack, take this Solar Charging Backpack with you on your next outdoor adventure for unlimited backup power source. The 1600 mAh battery pack is constantly being charged by a waterproof and scratch resistant solar panel, making it the ideal emergency power supply that can be used at any time to add many more hours of usage for your electronic devices. In addition, the battery pack includes a white LED light which can function as a small, emergency torch light. People are becoming increasingly dependent on their cell phones and MP3 players which always seem to run out of power just when they're needed the most. With this Solar Charging Backpack, you can finally gain peace of mind knowing that an emergency power supply is always available to keep your electronic devices charged. Best of all, the 8 included adapter tips will work with anything from mobile phones to digital camcorders to handheld game consoles to MP3 players. For something completely unique, this Solar Charging Backpack also includes quality stereo speakers on the back so you can take your music everywhere. The speakers run on four AAA batteries and can connect to any 3.5mm audio source, letting you freely listen to music in the open air without using headphones. Backpack, emergency power supply, stereo speakers - all in one! Available in our warehouse now and brought to you at our usual low factory-direct wholesale price, order today and we will express ship it tomorrow, guaranteed! Brought to you by the leader in wholesale electronics and audio gadgets - Chinavasion. What can I use with the stereo speakers? Any audio device if you have the cable! The speakers take a 3.5mm audio in. Does the solar panel charge only using sunlight? The solar panel uses any light source to power the battery pack!